Sam's of Brighton is a lively bistro tucked away in the Kemp Town quarter of Brighton. With five visiting (and hungry) friends in tow, we really couldn't be bothered to head into town centre. Saying that, Kemp Town is increasingly becoming a bit of a foodie hot-spot with Blanch House, Drakes and the announcement of The Ginger Dog, another gastro-pub from the group that own The Ginger Pig. Good news for me as it's my neck of the woods! Anyway, having recently gone to Seven Dials restaurant and been a bit well, bored by the whole meal, I wasn't expecting too much from Sam's as they are owned by the same family and the menu reads similarly. But even before you put a napkin on your lap you know you are in for a different experience at Sam's. For one the interior is far nicer, cosier and buzzier. The staff are chirpier. Customers are smiling. Let's get straight into the food as franky, it knocked my socks off. I chose both my main and pudding from the specials board and all but one of us also opted for the Slow braised Shoulder of South Downs Lamb with Boulangere Potatoes, Salamanca Lentils and Salsa Verde (£13.00). This plate of food worked so, so perfectly. 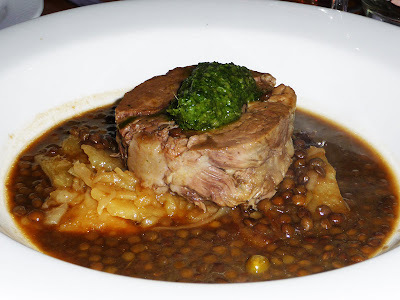 Succulent, sweet lamb with the comforting lentils and then the zing of the salsa verde. One bite in and our table chiored a uniform mmmmmm tune, culling our preceeding animated chatter to a slience as we all privately concentrated on how jolly marvelous this plate of food was. 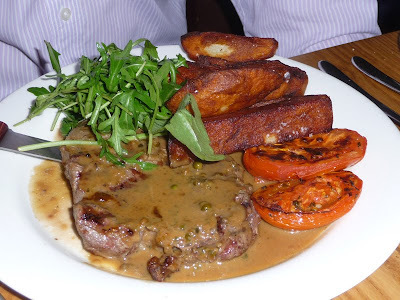 Mr. GF's likes to be different and ordered the Rib-Eye Steak with Proper Chips, Peppercorn Sauce & Red Wine Jus (£17.95). He was in very dangerous food envy ground as we were all tucking into our prefect lamb dish, but his was also very delicious and quite a treat for the eyes too. His comment was that it was the best steak he had eaten in ages, cooked to perfection, and the chips were indeed "proper". 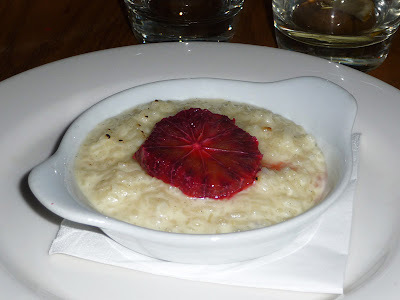 For dessert I went with a twist on an old school classic with a Blood Orange Rice Pudding (£5.50). I really loved this. Creamy and perfectly cooked rice with the welcome shock of blood orange made a typically frumpy dessert very elegant indeed. The staff were friendly and really nice to our pregnant friend's demands for bottomless glasses of milk! I like how Sam's champions local Sussex produce, and you could certainly taste the quality in the ingredients. It's been a while since I've experienced such a faultless and enjoyable dinner out. Sam's ticks all the boxes; local, friendly, affordable, unpretentious yet refined. I'll be back.